Working with Katello – part 1. We’ll use Katello to create a product that contains RPM repositories, we’ll also create a content view as well as promote the content view to a lifecycle environment. 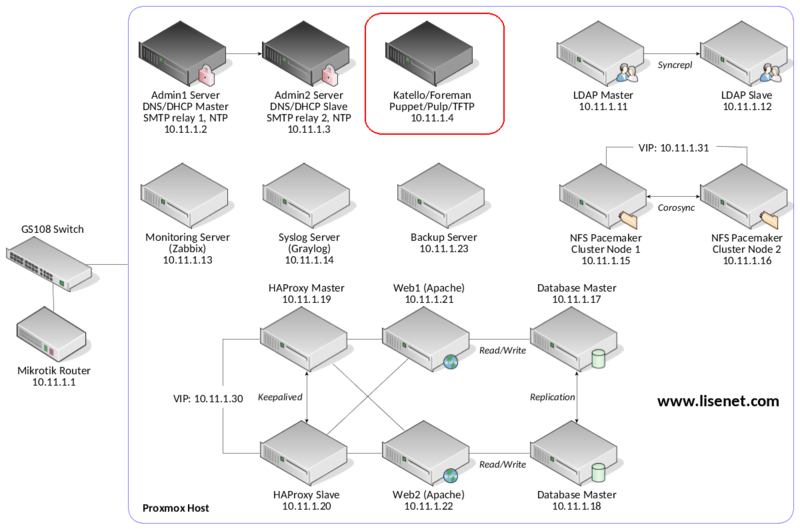 This article is part of the Homelab Project with KVM, Katello and Puppet series. See the image below to identify the homelab part this article applies to. All of this can be found in the official Katello user guide, therefore I’ll reference the main points only. Repository – Collection of content (either RPM or Puppet). Product – Collection of Repositories, Content Hosts subscribe to a product. Library – A special pre-created Lifecycle Environment where Repositories are created and content is synced or uploaded to. A Content Host can subscribe to library and receive content as soon as the content is synced or uploaded. Content View – snapshot of one or more repositories and/or puppet modules. Publishing – Content Views are “published” in order to lock their contents in place. The content of the Content View is cloned and all filters applied. Publishing creates a new version of the Content View. Promoting – Content Views can be cloned to different Lifecycle Environments (dev, test, prod). If you’re not familiar with Katello then I recommend you giving the official Katello user guide a go. Hammer is the CLI tool for Foreman. We will be using Hammer exclusively. This article assumes saved credentials in ~/.hammer/cli.modules.d/foreman.yml. Because many hammer commands are organisation specific, we can set a default organisation and a default location for hammer commands so that we don’t have to specify it every time. # hammer defaults add --param-name organization --param-value "Lisenet"
# hammer defaults add --param-name location --param-value "HomeLab"
Below is a step-by-step plan that we’ll be following in this article. Step 1: create a product. Step 2: download and import GPG keys. Step 3: create RPM repositories. Step 4: sync RPM repositories. Step 5: create a content view. Step 6: add repositories to the content view. Step 7: create a lifecycle environment. Step 8: publish a content view. Step 9: promote the content view version to lifecycle environment. Step 10: create an activation key. Step 11: add subscription to the activation key. Step 12: backup Katello configuration. Create a product that will be used for RPM repositories. --description "Various repositories to use with CentOS 7"
GPG keys provide a way to verify the integrity of packages found within a repository or a product. Note that GPG keys that you need will depend on the repositories that you plan to use. In my case I’m going to need the ones listed below. Katello repository to download the latest client from. Currently not GPG signed. Remi PHP 5.6 repository. Note that PHP 5.6 will receive security support until year December 2018. Elasticsearch 5.x repository. At the time I write this, Graylog 2.4 does not work with Elasticsearch 6.x. If that’s not an option then you’ll likely have to sync them one by one. Note that the initial synchronisation may take a while. A content view is a snapshot of one or more repositories. --description "Content view for CentOS 7"
1  | el7_repos | Various repositories to use with CentOS 7 | Lisenet      | 16           | Syncing Complete. A lifecycle environment is like a container for content view versions which are used by content hosts. We can have different “containers” for different lifecycle environments (eg. dev, qa, prod). There is a special kind of Lifecycle Environment that does not have a parent, it’s called Library. The library serves as the main container for synced content such as products, puppet modules, and published content views, and every organisation has a library. In practise, we can use the library environment as our homelab test environment (simply because it’s already there), and anything that gets tested and later becomes stable can be promoted to a subsequent environment. Following this logic we will call our lifecycle environment as “stable”. We need to published a content view in order to lock its content (RPM repositories) in place. The initial version of the content view, which is version 1.0, contains recently synced RPM repositories, and does not have any changes, therefore it’s OK to promote it to our stable lifecycle environment. Activation keys provide a way to define properties that can be applied to Content Hosts during registration. We’ll create a new key called “el7-key”. So now that we have products, repositories and content views configured, the next step will be to import Errata into CentOS repositories, configure Katello infrastructure (subnets, domains) and provisioning setup. This entry was posted in Linux and tagged CentOS, Foreman, homelab, Katello, Puppet, Red Hat Satellite 6. Bookmark the permalink. If you notice any errors, please contact us. Awesome work. I’ll continue reading. If I use Red hat in my environment (RHEL6, 7) and oracle databases, where do I find the GPG keys and repositories I need to add? If you have a RHEL subscription, then contact Red Hat to get access to their repositories. You should be using them on your RHEL system anyway. The same goes for Oracle, contact your supplier. Otherwise you can always use public repositories if you wish, e.g. CentOS (see here: https://wiki.centos.org/AdditionalResources/Repositories).